← Xavier University Hits #1 in Higher Education Rankings! Over the years, the hardworking staff has dutifully chronicled the must-by-now-be-a-million-dollars Yoko Ono has spent on full-page ads in the New York Times. Now comes yet another, in Sunday’s Times. October 9th, of course, would have been John Lennon’s 76th birthday. So for once, we won’t say the Rift Beatle should have just set her money on fire. 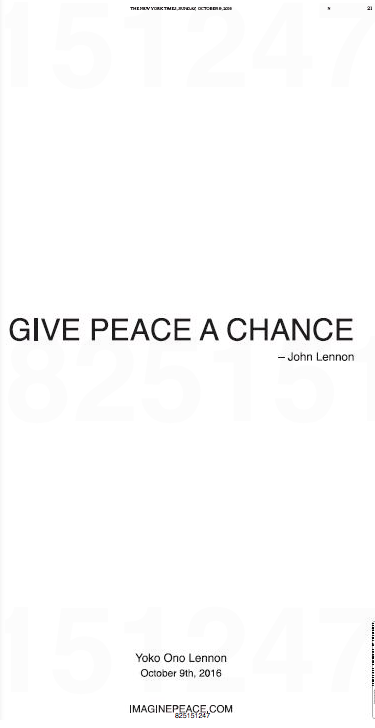 This entry was posted in Uncategorized and tagged 76th birthday, Give Peace a Chance, ImaginePeace.com, John Lennon, New York Times, Rift Beatle, Yoko Ono, Yoko Ono Lennon. Bookmark the permalink.